More news has been announced from NASA today, this time accompanied by a press conference and intriguing animations and graphics. NASA scientists have been studying a solar system very far away—almost 40 light years in distance, which means it would take 40 years to travel there if we could move at the speed of light. Using the Spitzer space telescope, which captures infrared (heat) radiation instead of visible light, scientists have identified a series of seven planets (named the TRAPPIST-1 system, after the acronym for the land-based telescope in Chile that first identified their existence) in close orbit to their own star, which is less intense than our Sun. 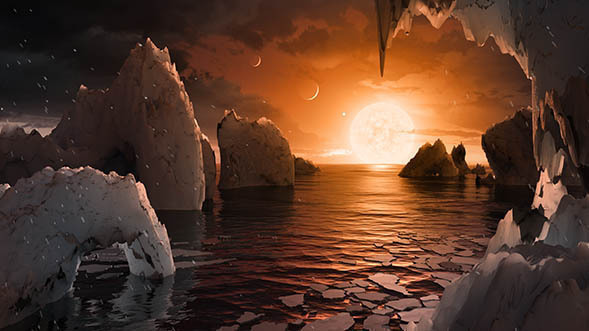 The major new finding is that at least three of these planets are Earth-sized, might harbor water, and are located at just the right distances from their star to possibly support living things. We’re not going to visit this solar system any time soon, and we still have plenty of work to do just understanding our own celestial neighborhood. But, this latest report is the latest entry in a flurry of data emerging from the ongoing search for Earth-like planets beyond our solar system. This is important to science, because it helps us understand the diversity of solar systems within our detection, and it helps us clarify (or expand!) our knowledge about what properties are required to support living things. Every year, we discover more and more of these exoplanets (planets outside our own solar system neighborhood). Collectively, they have greatly expanded our understanding of habitability and nudge us ever closer to determining what else, if anything, might be living in the universe. For more descriptions of the work, visit the NASA press release and related links on this page. Interviews with the scientists and further descriptions have been published through many news sources, such as this one from PBS.